I had bought the jelly belly fabric in two different backgrounds (white & black) some time after an out-of-town friend had come to visit and we visited the nearby Jelly Belly Factory. (Factoid: their "irregular" or "imperfect" jelly bellies are called "belly flops" and are available for purchase at the gift store.) My original intent was to make this friend a quilted "something" of the fabric, as a remembrance of her trip to see me. However, I ended up making this friend not only a quilt but a quillow (on 2 different occasions) so I think by the time this fabric percolated to the top of the heap, I decided that a third item was overkill. I haven't a clue where I got the layout, but it does show off the positive/negative colorways rather nicely. 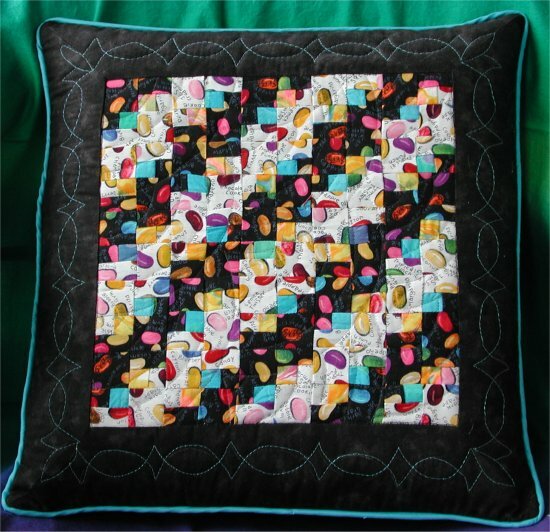 A wide black border sets it off nicely, along with some simple quilting with metallic thread. The piping along the seamline is the same color as the border quilting thread.